Vitamin D aids in the absorption of calcium, helping to form and maintain strong bones. This D3 is made from lichen, a plant, a natural source of Vegan D3. Sunlight is needed for the body to naturally produce D3. However, people who spend a lot of time indoors, or use sunblock, may not produce sufficient levels of this fundamental vitamin. 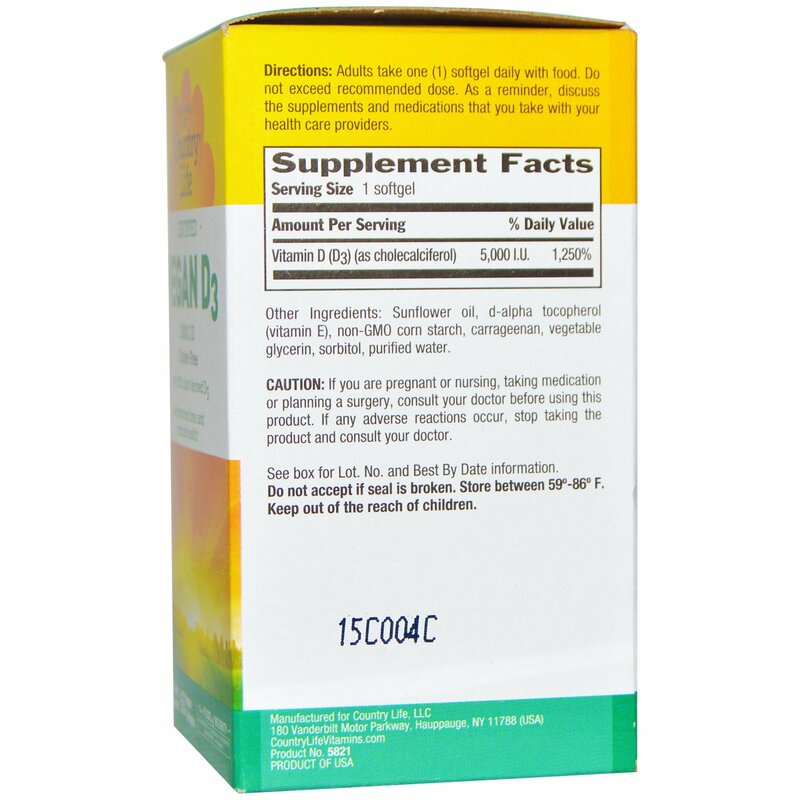 Supplements are needed to help fulfill the daily requirements. Vitamin D promotes bone and immune health. The complementary benefits of vitamin D3 with calcium absorption is well known, but did you know that vitamin D3 also helps to support our immune system? Up until now, the source of vitamin D3 has been animal sourced, and not suitable for a vegan lifestyle or those who prefer a plant-based vitamin. Country Life now offers Vegan D3 in a 100% plant-derived form. To further complement your supplement regimen, try Country Life Target Min's line of calcium and minerals. Available in a range of formulas, potencies, and sizes to best meet your needs. At Country Life, integrity is our #1 ingredient. Every product is rigorously tested to ensure it measures up against Country Life's 5 Integrity Standards: 1) authenticity of ingredients; 2) cleanliness of ingredients; 3) freshness of ingredients; 4) consistency of the formula; and 5) accuracy of labeling. It contains Vitashine, a plant-based Vitamin D made from lichen, a natural source of vegan D3. Country Life is leading the way with this truly unique D3 formula. Directions: Adults take one (1) softgel daily with food. Do not exceed recommended dose. As a reminder, discuss the supplements and medications that you take with your health care providers. Sunflower oil, d-alpha tocopherol (vitamin E), non-GMO corn starch, carrageenan, vegetable glycerin, sorbitol, purified water. 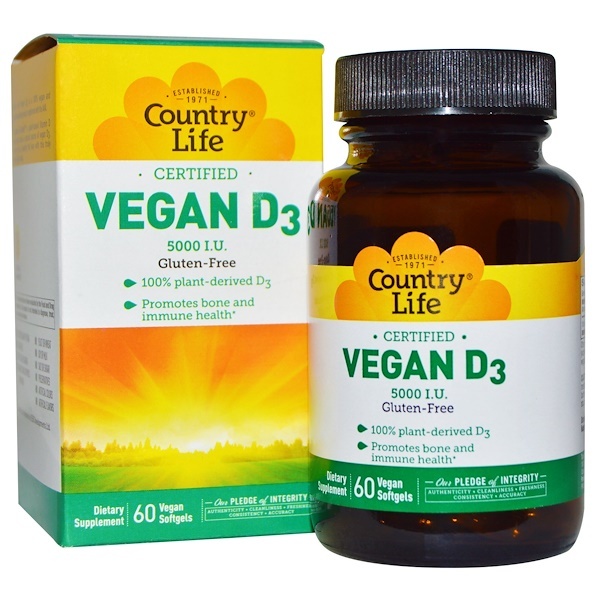 Country Life Vegan D3 is a 100% vegan and vegetarian suitable product, registered with the AVA.